Most local young punk bands these days play some kind of street or melodic punk, but as true anarchists Defeat have sold their souls to the spirit of crust core, and everything, from the cover artwork to the way they write their band name to the music and the lyrics, is proof of that attitude. As a young band, they naturally have to fight with the problems that come with the lack of experience. I am surprised at the high technical level of the band members, but then feel dismayed that all of this nearly drowns in the rehearsal room quality of the recording. The two guitars give the music enormous power, the bass guitar is nervous like a bumblebee, while the drums are thrashing through the songs. 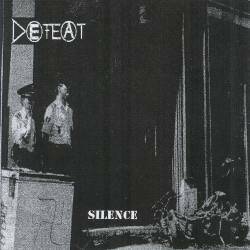 The short pieces are brutal eruptions of violence, the longer ones are normally introduced by a melodic instrumental intro before the aggressive parts take over again. The vocals are only ok though, they lack the necessary ferocity and articulation that would make the songs even more brutal. The lyrics are also probably better meant than formulated. Eventually we are left with a promising debut that could have gained enormous momentum from a better production. Silence most of the time convinces with good song writing, especially Stop Torturing Animals shows potential. The only time Defeat really screw up is with We Don't Need A Leader that sounds like some drunkards played on detuned instruments. If you like straight in your face crust core, then you should by all means support this band, although most people will prefer to wait for a better sounding follow-up.